Applications for the 2019 award are now open. The deadline for applications has been extended to 31st March 2019. The rules and an application form are available here. Please contact the Guild President for any more details. 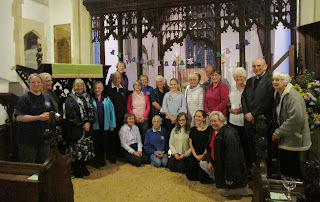 On Friday 15th September, about 20 members of the Eastern district of the Ladies Guild, and six members of the Dorothy L Sayers Society converged on the church of St Mary Magdalene, Thornham Magna, in Suffolk. We were there to attend the presentation of the Dorothy L Sayers Society Young Ladies Guild Ringer Award 2017 to the winner, Carmen Wright. When I arrived, the bells were being raised in the tower, and canapes were being served in the nave of the church. Prior to the arrival of the members of the DLS Society, when wine was served and more canapes appeared, everyone had an opportunity to have a ring on the bells. The presentation began with an introduction and welcome by Val Counter, Vice President of the Eastern district. Sylvie Fawcett, who rings at Thornham Magna, gave a short talk about the village, church, and bells of Thornham Magna: the oldest of the ring of six bells date from the 1490s; and an interesting feature of the church is the window at the west end on the south side of the nave, which was designed by Burne Jones and made by Morris & Co. This was followed by a brief introduction by Seona Ford, Chair of the DLS Society, to life and work of Dorothy L Sayers, and the purpose and activities of the Dorothy L Sayers Society. The Society also gives awards for music, design, and theatre, which represent some of the other interests of Dorothy L Sayers. Betty Baines spoke about the Eastern District of the Ladies Guild: this is the largest district in the Guild both geographically and in terms of the membership. Betty also talked about the purpose of the Ladies Guild as a learning organisation in which members can progress in a supportive and encouraging environment. A touch of Grandsire Doubles, with Carmen in the band, was then rung, before three members of the Dorothy L Sayers Society delivered a reading from the Nine Tailors. The award was then presented to Carmen by Seona Ford. After Carmen said her "thank yous", her mother, Zoe, was presented with a bouquet of flowers from the Eastern district; Val explained that this was to acknowledge the support that Zoe, who started learning to ring at the same time, has given to Carmen. A very short speech of thanks from me closed the formal part of the evening. After the group photograph was taken with several cameras, we took the opportunity to mingle and chat while we quite happily did justice to the comestibles provided by the members of the district. Carmen started ringing in June 2013 at the age of 9, with the aid of several boxes. She accompanied her mother Zoe to the Thornham Magna practices, where they both learned together, taught by Sylvie Fawcett. They were both enrolled in the “Learning the Ropes” progressive learning scheme and Carmen rapidly advanced from level 1, ringing rounds in February 2015, trebling to her first quarter peal in April 2016 for level 3, ringing her first quarter inside to Plain Bob Doubles in January 2017 for level 4, and in two weeks time she will be attempting to ring her first quarter inside to Plain Bob Minor for level 5, which will complete the final stage. In between times, she has rung several quarter peals of doubles, inside, in various methods and has become something of a perfectionist, getting very cross with herself if she makes a mistake. Carmen has a tremendous talent for the art of bell ringing. She is not put off by ringing at new towers and has a special ability to be able to look at the line of a method and go ahead and ring it. Both Carmen and Zoe are valued members of the Ladies Guild and we hope they will continue to enjoy the challenge of learning more advanced methods and visiting lots more towers within our district and hopefully further afield. Report by Helen Webb, President of the Ladies' Guild. The award was presented to Rebecca Stuttard of South Eastern district, at Kemsing on Friday 30th September..
Members of the Dorothy L Sayers Society travelled from Essex, Gloucestershire and Northamptonshire for the presentation. One of them is a ringer, so we had a ring before the presentation, to ensure that he got a grab. Fraser Clift, Ringing Master at Kemsing, welcomed us all and talked about some of the interesting features of the church, literary links with the village and some quotes from Dorothy L Sayers. Seona Ford, Chair of the Society, spoke about the life and work of Dorothy L Sayers. I spoke about the Ladies Guild and we then rang a touch of Grandsire Doubles. Members of the Society read an extract from the "Nine Tailors" after which Seona presented Rebecca with the award. Following group photos, the members of the Society headed off to the local pub for dinner while we stayed in the church and made suitable inroads into the feast kindly provided by Caroline Stockmann and appreciated by us! In the group photo, from left to right: Caroline Stockmann, Isabel Pearce, two DLS Society members, Fraser Clift, Seona Ford and another DLS member, Rebecca Stuttard, two more DLS members, me, Michael Stuttard. The smaller photo shows Rebecca and Seona. 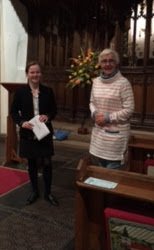 Hannah Williams from Harefield Middlesex was presented with The Young Ringer of The Year Award by Seona Ford of The Dorothy L Sayers Society on Wednesday 23rd September at 7.00 pm at St Mary’s Church Harefield. Pictured (left) with Hannah and Seona Ford is Liz Davey, President of the Ladies Guild. Hannah from Central District is a third generation ringer, pictured right with her Grandfather Chris Lomax from Pinner, Mum Danielle and Dad Mark who has also learnt to ring making it a family event. She received a cheque which she intends to spend on a Ringing Course, to enable her to move from ringing Plain Hunt on 5 and 6 bells to method ringing. We wish her every success. 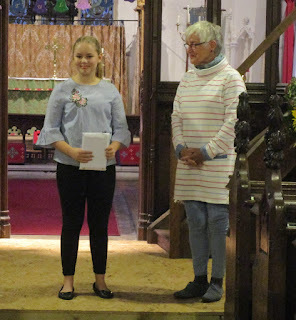 Kait Jarvis from Lympsham in Somerset was presented with The Young Ringer of The Year Award by Seona Ford of The Dorothy L Sayers Society on Saturday 30th August 2014 at Holy Trinity, Burrington in Somerset. Kait rang in a Quarter Peal before the presentation to celebrate her award. She received a cheque which she intends to spend on a Ringing Course, probably Hereford. Kait loves ringing and has made tremendous progress in a very short time. She rang in The Ringing World National Youth Competition and takes every chance she can to visit new towers. At the meeting of The Marches District held on Saturday, 31st August, Emily Davies of Berriew, a junior member of the District, was presented with The Dorothy L. Sayers Society, Young Lady Ringer Award by Seona Ford, Chairman of the Society. Emily was given a handsome cheque to spend on continuing her ringing progress, a book about Dorothy L Sayers & the Society, with a certificate from the Ladies Guild to mark the occasion. Emily thanked the President and all who had helped her with her ringing especially Ann & Neil Bennett of Welshpool. Thanks are also due to Rachel Hamer for introducing Emily and her older sister Laura to the Ladies Guild. During the afternoon, local ringers supplied tea and cake, which together with the glorious weather helped to make a perfect day. The meeting was held on a beautiful day in the Corvedale Valley between Ludlow & Bridgnorth in Shropshire. Members were joined by Elizabeth Davey, National President of the Ladies Guild plus members of the DLS Society together with Andrew, Emily's Dad, and Ann and Neil. Ringing took place at Tugford & Chetton. After lunch at The Down Inn, near Bridgnorth we moved to Morville for the meeting, the presentation and then for ringing. The 2012 award went back to Eastern District. Their newsletter announced: "Fantastic news: We have another Dorothy L. Sayers Young Ringer of the Year winner!! Catherine Richardson from Linton, Cambridgeshire, has had notification that she has won the DLS award and she is delighted. She has chosen to attend the Bradfield Ringing Course in Berkshire in August. Our warmest congratulations to her!" The award was presented to Catherine by the vice chairman of the Dorothy L. Sayers Society at the Ladies Guild centenary service held at Christ Church, Isle of Dogs at the end of the London Ringing day on 28th April. Catherine attended the course in August and, as several other Ladies Guild members were there as helpers, they achieved a quarter peal of Grandsire Doubles with Catherine on the 4th. The 2012 award attracted so many good entries that our president Jan Wyatt decided to award two runners up as well as the winner. These awards went to Chloe Jones, of Lancaster, and Alice Moden, of Chatteris, Cambridgeshire who also rings in Canterbury. The award was continued in 2011 and this time went to the Western District. The presentation was made at SS Quericus & Julietta, Tickenham, Somerset to Leah Gill aged 11 years of Portishead. 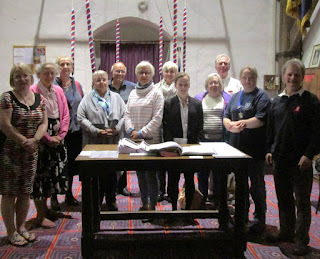 Members of the Dorothy L. Sayers Society and The Ladies' Guild plus members of Leah’s family gathered to see Christopher Dean, Chairman of the DLS Society present ringing books and poetry books to Leah along with a cheque to allow her to attend a ringing course later in the year. A proposal was made at the Ladies' Guild 2011 AGM by Janet Wyatt that, if the DLS Society should in the future not continue with the award, it should be continued and be funded by the Guild as a way of encouraging younger members. This led to discussion about how to advertise it on the website with an application form and rules. This was agreed unanimously, and the award would be advertised in this way for 2012 when the DLS Society were again funding the award. It was also considered whether the Guild should be prepared to fund the expenses of a parent or guardian travelling with the chosen young ringer if she is 18 or under. In 2010 there was another award from the Dorothy L. Sayers Society and members were encouraged to attend the presentation by Dame Norma Major at Bluntisham in Cambridgeshire on 26th June. The winner this year was Fliss Lister, a student from Northants District. Due to her exams she was unable to attend the Hereford Course but went in July to the Keele Course in the Stedman Group, with her husband Dan who was also learning to ring. This award came about as the result of an invitation from the Dorothy L Sayers Society to the Ladies' Guild to attend a service at St Margaret’s, Westminster to mark the 50th anniversary of the author’s death. 50 years earlier there had been a Memorial Service for her at St Margaret’s though her actual grave is under the tower of St Anne’s, Soho. The Ladies' Guild were invited because Dorothy L Sayers had spent some time learning to ring and visiting towers to get background for her book, The Nine Tailors. The Ladies' Guild played a significant part in her learning and at their Jubilee Dinner in 1937 she was guest of honour and was elected an honorary member of the Guild. The invitation was circulated to all districts and January 15th 2008 saw members from Cumbria, Jersey, Kent, East Midlands, East, South and West all converging on the capital. Theo Crowder from Eastern District described the event as ‘A Very Special Day’. Such a splendid turnout by the Ladies’ Guild so impressed the Society that they decided to make an award the following year to enable a young female ringer to attend a training course. An Eastern District member, Chloe Guthrie aged 11, was selected after writing an excellent application and was able to attend the Hereford Ringing Course. Her grandmother, Betty Taylor, another district member, was able to accompany her. The presentation was made at Bluntisham, Cambridgeshire, which was the parish where Dorothy L Sayers lived for 20 years while her father was rector. It became the inspiration for her novel, The Nine Tailors. The presentation was by Dame Norma Major an ex ringer and supporter of the Guild. Betty Baines wrote in the Eastern District annual report "The ceremony was reported in newspapers, blogs and internet news sites and was fantastic publicity for ringing and the Ladies Guild."